Just wanted to give a quick recipe for making buttermilk scones. Yes, scones do contain a deceptively large amount of butter. But once and awhile, it's okay to indulge and share the extras with others. This recipe made about 16 and I shared them while visiting my family earlier today. I adapted my buttermilk scones recipe from reading Martha Stewart's recipe for baking powder biscuits and writing my own buttermilk based recipe. (Note: Martha's baking book is a great baking resource that taught me how to bake in the beginning). Mix the dry ingredients and put in the basin of your artisan mixer. Then cut in the butter and mix. Mix into the heavy cream and fold into the dough. 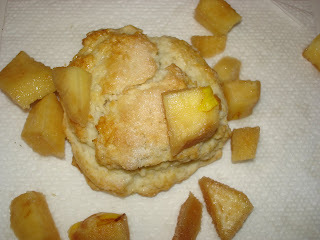 Mold into scones – the recipe made about 15 for me. I separated them about an inch or two apart on the baking sheets and molded into scone like shapes. Before baking, glaze each with an egg wash (from a beaten egg) and sprinkle some sugar on top. Bake at 400 degrees for 20 minutes. I love to eat scones with fruit. 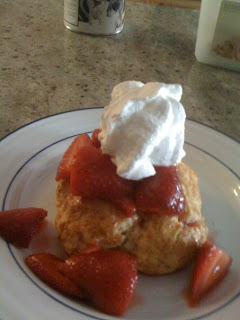 In the summer, I turned this recipe into strawberry shortcake with fresh strawberries. Cut up two pints of strawberries. Mix with 2 T of lemon juice and 3 T of sugar and put on top of the scones. It’s instant strawberry shortcake. Today, I did the same thing, but cut up a quince. I think the recipe would also taste great using kiwi. Scones are another favorite treat that Paul and Alex like. I will have to try your recipe with the quince.